Offers > SAS > IIA: Will Your Evolving Business Intelligence Strategy Make It or Break It? 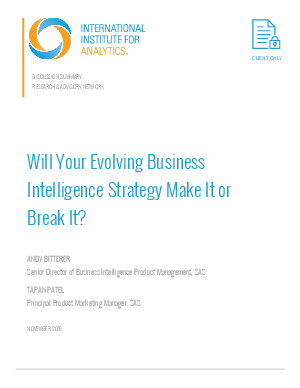 IIA: Will Your Evolving Business Intelligence Strategy Make It or Break It? Business intelligence has come a long way ? from assistance with report generation to self-service platforms for discovery and analytical insight. As technological capabilities and business aptitude with information continue to advance, the next generation of BI will be even more capable and valuable to the enterprise. To discuss today’s success factors and tomorrow’s opportunities, IIA spoke with Andy Bitterer, Senior Director of Business Intelligence Product Management at SAS, and Tapan Patel, Principal Product Marketing Manager at SAS.